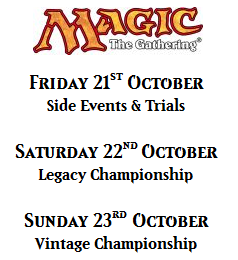 Bazaar of Moxen is pleased to announce the organization of the first Eternal Week-end (ETW) in Europe in collaboration with Wizards of the Coast! Throughout the week-end, we'll be able to offer the exciting and super-demanded Chaos Draft! So be ready and save the date for this event happening from 21st to 23rd of October 2016 at Espace Charenton, 327, rue de Charenton 75012, inside the beautiful Paris.